The official breed standard – as acknowlegded by the WUSV (Weltunion der Schäferhundvereine) – has to be regarded as the ´measure rod´ for each German Shepherd Dog. The German Shepherd Dog is a trotter. His gait exhibits diagonal movement, i.e., the hind foot and the forefoot on opposite sides move simultaneously. The limbs, therefore, must be so similarly proportioned to one another, i.e. angulated, that the action of the rear as it carries through to the middle of the body and is matched by an equally far-reaching forehand causes no essential change in the topline. Every tendency toward overangulation of the rear quarters diminishes soundness and endurance. The correct proportions of height to length and corresponding length of the leg bones results in a ground-eating gait that is low to the ground and imparts an impression of effortless progression. With his head thrust forward and a slightly raised tail, a balanced and even trotter will have a topline that falls in moderate curves from the tip of the ears over the neck and level back through the tip of the tail. Sound nerves, alertness, self-confidence, trainability, watchfulness, loyalty and incorruptibility, as well as courage, fighting drive and hardness, are the outstanding characteristics of a purebred German Shepherd Dog. They make his suitable to be a superior working dog in general, and in particular to be a guard, companion, protection and herding dog. His ample scenting abilities, added to his conformation as a trotter, make it possible for him to quietly and surely work out a track without bodily strain and with his nose close to the ground. This makes him highly useful as a multipurpose track and search dog. The head should be in proportion to the body size (in length approximately 40% of the height at the withers) and not coarse, overrefined or overstretched(snipey). In general appearance, it should be dry with moderate breadth between the ears. The forehead when viewed from the front or side is only slightly arched. It should be without a center furrow or with only a slightly defined furrow. The width of the skull should correspond approximately to the length of the skull. Also, a slight oversize in the case of males or undersize in the case of females is not objectionable. The muzzle is strong; the lips are firm and dry and close tightly. The bridge of the nose is straight and runs nearly parallel with the plane of the forehead. Dentition must be healthy, strong and complete (42 teeth, 20 in the upper jaw and 22 in the lower jaw). The German Shepherd Dog has a scissors bite, e.g. the incisors must meet each other in a scissorslike way, with the outer surface of the incisors of the lower jaw sliding next to the inner surface of the incisors of the upper jaw. An undershot or overshot bite if faulty, as are large gaps between the teeth. A level bite is faulty, as the incisors close on a straight line. The jaws must be strongly developed so that the teeth may be deeply rooted. The ears are of medium size, wide at the base and set high. They taper to a point and are carried facing forward and vertically (the tips not inclined toward each other). Tipped, cropped and hanging ears are rejected. Ears drawn toward each other greatly impair the general appearance. The ears of puppies and young dogs sometimes drop or pull toward each other during the teething period, which can last until six months of age and sometimes longer. Many dogs draw their ears back during motion or at rest. This is not faulty. The eyes are of medium size, almond shaped, somewhat slanting and not protruding. The color of the eyes should blend with the color of the coat. They should be as dark as possible. They should have a lively, intelligent and self-confident expression. The neck should be strong with well-developed muscles and without looseness of the throat skin (dewlaps). The neck is carried at an angle of about 45 degrees to the horizontal. It is carried higher when excited and lower when trotting. The body length should exceed the height at the withers. It should amount to about 110 to 117% of the height at the withers. Dogs with a short, square or tall build are undesirable. The chest is deep (approximately 45 to 48% of the height at the withers) but not too wide. The underchest should be as long as possible and pronounced. The ribs should be well formed and long, neither barrel shaped nor too flat. They should reach the sternum, which is at the same level as the elbows. 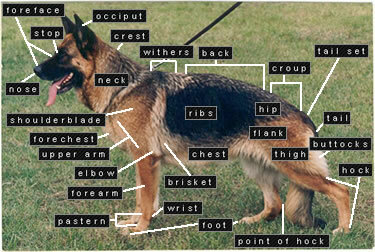 A correctly formed rib cage allows the elbows freedom of movement when the dogs trots. A too round rib cage disrupts the motion of the elbows and causes them to turn out. A too flat rib cage draws the elbows in toward one another. The rib cage extends far back so that the loins are relatively short. The abdomen is moderately tucked up. The back, including the loins, is straight and strongly developed yet not too long between the withers and the croup. The withers must be long and high, sloping slightly from front to rear, defined against the back into which it gently blends without breaking the topline. The loins must be wide, strong and well muscled. The croup is long and slightly angled (approximately 23 degrees). The ileum and the sacrum are the foundation bones of the croup. Short, steep or flat croups are undesirable. The tail is bushy and should reach at least to the hock joint but not beyond the middle of the hocks. Sometimes the tail forms a hook to one side at its end, though this is undesirable. At rest the tail is carried in a gentle downward curve, but when the dog is excited or in motion, it is curved more and carried higher. The tail should never be raised past the vertical. The tail, therefore, should not be carried straight or curled over the back. The shoulder blade should be long with an oblique placement (the angle at 45 degrees) and lying flat against the body. The upper arm joins the shoulder blade in an approximate right angle. The upper arm as well as the shoulder must be strong and well muscled. The forearm must be straight when viewed from all sides. The bones of the upper arm and forearm are more oval than round. The pasterns should be firm but neither too steep nor too down in pastern (Approximately 20 degrees). The elbows must be neither turned in nor turned out. The length of the leg bones should exceed the depth of the chest (approximately 55%). The thigh is broad and well muscled. The upper thigh bone when viewed from the side joins the only slightly longer lower thigh bone at an angle of approximately 120 degrees. The angulation corresponds roughly to the forequarter angulation without being overangulated. The hock joint is strong and firm. The hock is strong and forms a firm joint with the lower thigh. The entire hindquarters must be strong and well muscled to be capable of carrying the body effortlessly forward during motion. The feet are relatively round, short, tightly formed and arched. The pads are very hard, but not chapped. The nails are short, strong and of a dark color. Dewclaws sometime appear on the hind legs and should be removed within the first few days of birth. Color should be black with regular markings in brown, tan to light gray, also with a black saddle, dark sable (black cover on a gray or light brown case with corresponding lighter marks), black, uniform gray or with light or brown markings. Small white markings on the forechest or a very light color on the insides of the legs are permissible though not desired. The nose must be black with all coat colors. (Dogs with little or no masks, yellow or strikingly light eyes, light markings on the chest and insides of the legs, white nails and a red tip of the tail or washed out weak colors are considered lacking in pigment.) The undercoat or base hair is always light gray, with the exception of that on black dogs. The final color of a puppy is only determined when the outer coat completely develops. The outer coat should be as thick as possible. The individual hairs are straight, coarse and lying flat against the body. The coat is short on the head inclusive of the ears, the front of the legs, the feet and the toes but longer and thicker on the neck. The hair grows longer on the back of the fore- and hind legs as far down as the pastern and the hock joint, forming moderate breeching on the thighs. The length of the hair varies, and due to these differences in length, there are many intermediate forms. A too short or molelike coat is faulty. The individual hairs are longer, not always straight and above all not lying close to the body. The coat is considerably longer inside and behind the ears, on the back of the forearm and usually in the loin area. Now and then there will be tufts in the ears and feathering from elbow to pastern. The breeching along the thigh is long and thick. The tail is bushy with slight feathering underneath. The long-smooth-coat is not as weatherproof as the medium-smooth-coat and is therefore undesirable; however, provided there is sufficient undercoat, it may be passed for breeding, as long as the breed regulations of the country allow it. (Note: The SV no longer allows the long smooth coat with sufficient undercoat. New translation of the standard will be posted here when the English version is released). With the long smooth coated German Shepherd Dog, a narrow chest and narrow overstretched muzzle are frequently found. The coat is considerably longer than that of the long-smooth-coat. It is generally very soft and forms a parting along the back. The undercoat will be found in the region of the loins or will not be present at all. A long coat is greatly diminished in weatherproofing and utility and therefore is undesirable.